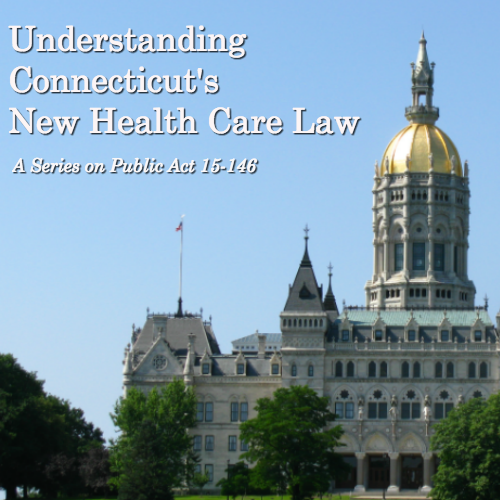 This is the first in a series about SB-811, a landmark health care bill that passed in the Connecticut General Assembly this year, now known as Public Act 15-146, AN ACT CONCERNING HOSPITALS, INSURERS AND HEALTH CARE CONSUMERS. In this series, we will examine the different elements in the larger bill, as it collected a wide range of new laws and changes to current laws. Today, we tackle Section 19. Section 19 requires a study of rising health care costs in the state and for a report to be issued to the legislature by January 1, 2016. The law asks that Insurance Commissioner Katharine Wade convene the working group to conduct the study. It’s members must include the Comptroller (Kevin Lembo), Commissioner of Public Health (Dr. Jewel Mullen) and the Office of the Health Care Advocate (headed by Victoria Veltri). The costs of health care are a critical problem in our health system—costs are rising and more and more of those costs are put on the consumer. This report is attempting to capture the “why” of those costs, and get recommendations of how to contain costs moving forward. This is good news for consumers, since it means that the state is trying to contain costs for consumers and for the state. But don’t break out the champagne yet–it is only the beginning, a small first, critical step onto the path in the “better for all of us” direction. How much and why are prices increasing for health care services? How come an appendectomy at Hospital A costs $1000, but at Hospital B it costs $2500? What does each insurer/payer end up actually paying a provider for the appendectomy? What is the impact on what the state* and consumers pay of these rising costs and the variations in prices? Are there policies that can make the health care market more competitive, fair and cost-effective? Are there policies that can reduce the wide variation between what different health care providers charge, as well as the variation in the different negotiated rates health insurance companies end up paying to different providers? What are the effects of hospital consolidation and health care service integration on cost and quality of services? What factors impact the variations of cost–is it quality of care? Is it that some hospitals have a higher share of Medicaid and Medicare patients? Is it that some providers serve patients with poorer health? Do teaching hospitals make less money? Do some hospitals have higher administrative costs? These questions and more are the root of the call for this study. Yes. The report is due on January 1, 2016. *It is important to remember that the state is both a payer and provider of health care services. The state pays for health care services for HUSKY (Medicaid) beneficiaries, and for state employees via the State Employee Health Plan. It provides services at the UCONN Health Center. This means that the state has a vested interest in this subject, along with the impact rising health care costs have on all other consumers of health care services–the rest of us, who have private insurance, or are uninsured. You can find Section 19 on pages 45-47 in the PDF of Public Act 15-146, posted on the Connecticut General Assembly website. Here’s what I’d like them to study: Since my CT taxes already go toward welfare and the health benefits provided to those who receive it, why does part of my premium go toward pediatric vision care and pediatric dental care? It seems to me that this is just another not-very-well-hidden tax! I don’t have kids and have to pay for my own vision care and my own dental care which both become increasingly expensive as one gets older. If I were to choose a plan with a higher premium that would cover those expenses for ME, it wouldn’t eliminate the charges for children to whom my tax dollars are already going … I’d simply be paying a higher premium for services I might or might not use and continue to pay for services for children who are already covered under our high CT tax burden. And politicians wonder why people are leaving this state in droves!